Are room turns limiting your revenue, adding cost, and frustrating your team? 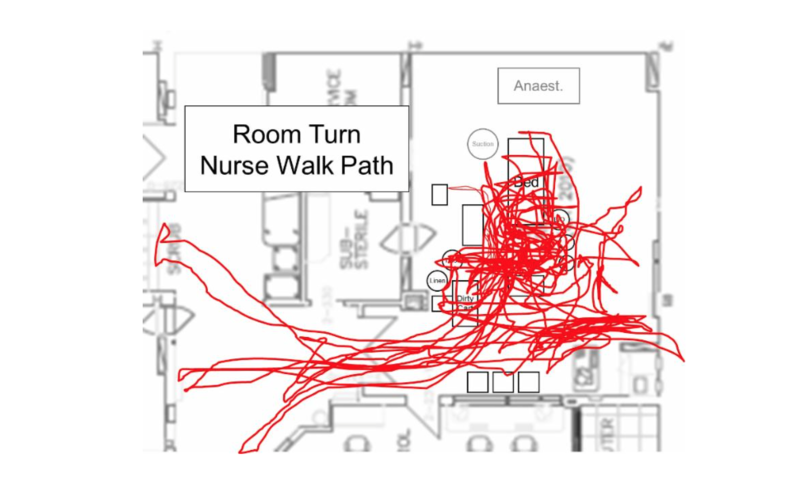 Does this walk pattern of a Nurse performing a room turn surprise you? Unfortunately, all too many people can identify with this and the painful consequences. We see a lot of different room turn practices and have helped our clients improve dramatically. A good room turn is like a work of art. A lot of detail and skill go into creating a reliable system. Below are a few of the many factors that come together to create room turns that will wow you with speed, safety, and quality. Are supplies in the right location, in correct amounts? Too much can be as bad as too little – carefully designed and managed inventory is a cornerstone of efficient room turns. Interruptions created by searching and transport of supplies and equipment add precious minutes that can cripple productivity. Roles and responsibilities must be clear, coordinated, and detailed. Standardize best practices for all roles – find and train “the one best way”. “Helping” is often code for chaos, leading to duplication, waiting, and errors. The key is well choreographed teamwork, where each person has specific tasks that are synchronized to ensure success. Align expectations, visibility, and accountability. Surgeons, Anesthesiologists, Nurses, Techs, and Management often have different concepts of “room turn”, creating confusion. When does the room turn start and end? What defines “quality” or “complete”? Is performance posted and consistently reviewed by all staff? Are trends monitored and root causes tied to correction plans? Easy to Say, Hard to Do – Opus can help! While these concepts sound simple, there is a lot of work in the details. And even the best solutions take expert change management to become reality. We are the experts in making these changes come to life. Reply directly to this email to schedule a free call with one of our experts. As a OR Manager conference attendee, if you move forward with an assessment by 8/31/2017, you will receive a 25% discount. At Opus Solutions, we are 100% dedicated to “performance improvement” in healthcare.